The Boca Grande Sea Turtle Association reported the first known hatch of the season on Tuesday, July 3. The nest was laid on May 7, so it incubated for 57 days. A juvenile Kemp’s ridley sea turtle – one of the most critically endangered species of sea turtles – was found near the Causeway in Boca Grande on June 28. The turtle was acting very lethargic and was transported by BGSTA patrol members to the Clinic for the Rehabilitation of Wildlife (CROW) facility on Sanibel Island. Mote Marine Laboratory in Sarasota was at capacity at the time. 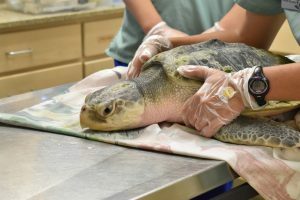 The turtle began receiving intravenous (IV) fluid treatment shortly after admission. Topical antibiotics were used to treat the corneal ulcers. After a few days in the hospital, the young turtle has made improvements. The corneal ulcers have resolved, and the turtle’s mentation and neurologic symptoms have improved. It is now bright and alert in the tank but has yet to regain its appetite. It is expected to make a full recovery. The Association is looking for some kindhearted folks who live locally, have a boat and would be interested in transporting stranded turtles to the facility on Sanibel Island. Currently, transporting a turtle to CROW takes about four hours (round trip) by car, so the trip would be much shorter by boat and less stressful on sick or injured turtles. This is a fairly rare event, so it would not be a regular commitment. As of June 29, the Association reported 359 Caretta caretta (loggerhead) turtle nests on the island. There were 333 reported false crawls (when a turtle comes up onto the beach but does not lay a nest). No Chelonia mydas (green) turtle nests have been discovered so far this year. To report stranded sea turtles and marine mammals in Lee County directly to FWC, call (888) 404-3922. Mote Marine stranding investigations program number is (941) 988-0212.